I don't have much info on this brewery other than its website and location. And also a story of how I obtained this 12 oz. bottle. 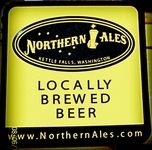 I ran into a past customer, and new found beer bud in Washougal, WA at A Beer At A Time. He literally took off back to his home to grab me this beer to try and review. I was thoroughly impressed and thankful for him doing that. He stated he really liked the beer and brewer, and hit the joint up when traveling out that way. Cheers Joey! And thank you. 12 oz. bottle, no date or abv stated. BeerAdvocate states 6% ABV. - This is a super dark porter, can't see through it at all in my standard pint glass. Nice light mocha finger of viscous head settled to a large lace and thin bubbly layer over the brew. A nice dark and pretty porter. What I would expect. - Perfect balance of chocolate malt, roasty light coffee character, and a lovely light salty smoke. Really a nice earthy woody aroma. Smells like a sessionable smoked porter. Solid as can be. Impressed. - I said wow to myself out loud. Clean and crisp porter with just the right light smoke flavors. Crisp bitter grassy hop and perfectly balanced with a subtle chocolate and roasted dark malt. 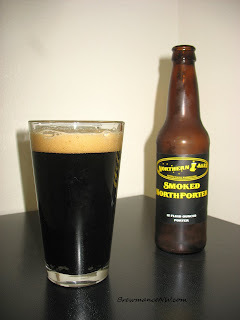 The smoke isn't at all too heavy, and compliments this solid porter perfectly. This is seriously a killer porter. 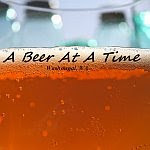 - Nice medium body, perfect dryness from the bittering hops, and perfectly carbonated. This is how a porter should feel. It's a bit chewy and only a tad chalky as its malt should deliver such. - Really impressed. Not because it was a freebie, or because I am doing some sort of favor...... this is just a really killer and lightly smoked sessionable porter. It's balance and bitter hop is perfect for my taste. I usually like porters to not have much of a hop profile, but being a smoked porter, it fits it just right. Super good. Now I think I must do some trades for more offerings from this brewer. 50% above the other reviewers!!! Never have I seen such a thing after a live review. They are either out of their minds, or this brewer just really perfected the beer. I wonder what they were thinking. Anyone else love this beer as much as I?